We face big decisions throughout our lives, but perhaps one of our most significant is how we’ll be cared for when we can no longer care for ourselves. It’s not something most folks are eager to think about, but it can be a positive experience. Some families make a decision early, placing a reservation at a retirement community or moving in well before care is an issue. In other cases, an emergency – such as an injury or illness – forces families to make quick decisions for a loved one. Some will enter a community as an active retiree, and will move through the stages of a community as their needs change. Others will find a place and call it home. According to the Assisted Living Federation of America, the average assisted living resident is an 87-year-old female who will stay for about 28 months, at a median cost around $3,326 per month. That’s just one part of the “continuum of care” that many communities offer. There’s independent living, for more active seniors, and skilled nursing care for those with daily assistance needs or Alzheimer’s/dementia. Many communities accept applicants as young as 55. Many factors will influence a family’s choice: How much care do mom and dad need? Will this community fit their lifestyle? How much will it cost, and can we afford it? Those are important things to consider, and each place will have different answers. This guide will help you to navigate those important questions, and will introduce you to some of the excellent care available within our region. It may not be the easiest decision your family will make, but it’s an important one. Thankfully, there’s plenty of help available. 1000 Falcon Point Place, Rockton, Ill.
For such an intimate facility, Highview in the Woodlands, in Rockton, places a heavy emphasis on its skilled, experienced staff. Both the assisted living apartments and the Alzheimer’s/dementia unit have around-the-clock care, with supervision from licensed nurses and certified nurses aids, with support from social services, food service and activities staff. Even the administration has significant experience – CEO Carol Cox has spent her entire career in health care. Residents here can get as much or as little care as needed. While some still drive their cars, others find value in supportive services such as weekly housekeeping, laundry services, social activities, regular church services and physical support. As residents age, additional services complement their changing needs. Opened in Rockford in 1904, Highview relocated to its current residence in 1999. The facility includes 36 assisted living apartments and 26 private memory care rooms. Rooms are equipped with call lights, and the entire facility has alarmed exits. Within the secured Alzheimer’s unit, residents receive additional support in a secure environment. Residents keep their minds active with a Montessori-approach therapy, using a life skills program that enhances memory and function. Cox also understands that families of Highview’s residents value this kind of support and care, because it’s one less worry for them. She makes it easy for families to get involved, through things like an Alzheimer’s support group for families and residents, and access to on-site laundry for loved ones. One of the more striking signs of Highview’s high-care approach is its pleasant scent – it doesn’t have that unpleasant nursing-home odor of yesterday’s care facilities. That’s a sign of quality and good care, says Cox. Another important sign is the longevity of Highview residency. Some on the assisted living side have been here since 2002. On the Alzheimer’s side, one resident arrived in 2005. That’s a good sign, says Cox. For families unsure about the right time to locate a loved one to a care facility, Cox says it depends on that person’s safety, security and wellness. When those things consistently slip, it’s time to start “shopping around,” perhaps for about six months to a year. Bring the prospective resident along, and let them see for themselves. The costs of living at Highview depend upon the services needed. There’s a wide menu of options, so Highview offers a free consultation. Fees are kept to a minimum – no gimmicks, and no entrance fees, community fees, holiday meal fees, application fees or invasive financial questioning. For nearly a century now, this nonprofit has cared for our region’s elderly, and the commitment continues, in a safe, friendly and caring environment. With studio and one-bedroom apartments, this community offers many ways to keep its residents in a comfortable environment for as long as possible. Nursing staff is available around-the-clock, and can assist with simple daily reminders or provide significant personal care. An outside provider offers additional services, such as physical and speech therapy, and in-home care. Crimson Pointe also helps its former service members to age comfortably, by connecting them with financial support through the federal Aid-in-Attendance program. Depending on the resident’s situation, assistance can range from about $1,100 to $2,600 per month, and can help to make the cost of assisted living more affordable. Shrum often meets with local community groups, to share the importance of planning ahead for retirement living. She offers suggestions about how to narrow your options, how to plan with a relative and when it’s the right time to move. Fairhaven’s mission is “to provide a comfortable lifestyle and exceptional care which enhances quality of life in a manner that glorifies God.” Spirituality is an important part of life at Fairhaven. “We’re very committed and never lose sight of why we’re here and who we’re here for,” says Chris Hintzsche, director of marketing and resident services at Fairhaven, who has worked with retirement communities for more than 25 years. The new Sjostrom Center chapel, which opened in 2012, is an example of the way priorities at Fairhaven are centered on the above mission statement. Residents enjoy various kinds of spiritual services throughout the week, along with a vespers service on Sunday. Some services are led by one of the two pastors on staff; others are led by community pastors or volunteer Fairhaven residents. Although affiliated with First Free Evangelical Church, Fairhaven offers a lifetime of care to people of all faiths age 62 and up. The 350 residents of Fairhaven enjoy a comfortable lifestyle with many opportunities. The property includes more than 100 duplexes, nearly 100 independent living apartments, a supportive care center and a health center. Inside the main building, residents enjoy an engaging atmosphere that includes a 24-hour coffee shop; a family room with computers; a video-chat unit; a library; restaurant-style dining; a gift shop; and a fitness center with classes guided by a fitness coordinator. Residents are invited to participate in special activities such as choirs, bell choirs and educational sessions, and to attend picnics, musical performances and other events. Pets are welcome to visit and may live with duplex residents. 500 E. McNair St., Winnebago, Ill.
With just 30 apartments overall, Prairie View Assisted Living feels like an intimate community. Considering that many residents are from Winnebago or nearby small farming towns, it’s a fitting environment. Located at the edge of town next to rolling farmland, this assisted living community is rural, yet conveniently located. Built in 2008, the homelike center’s one- and two-bedroom units include a large handicap-accessible bathroom, a kitchenette, an outdoor patio and enough space for personal furniture. Residents’ abilities range from fully independent to daily living assistance. Skilled care is not available here, but an around-the-clock staff is on hand to help with chores such as wake-up calls, medication reminders, getting dressed and showering. Housekeeping, meals and laundry are included in the monthly costs, which vary based on services and apartment size. It’s a busy community, and regular activities include field trips, church services, musical performances, holiday events and exercise programs. Bargman encourages families considering assisted living to meet the residents. “That’s going to tell you a lot about the quality of the care,” she says. Prairie View is owned by a for-profit company, but it offers assistance for war veterans through the Aid & Attendance benefit. Bargman says the community is adding a secured memory care unit, with 24-hour staffing, a separate dining room, and a social room. It’s one more way to keep residents comfortable. These sister facilities in Belvidere are a popular destination for Boone County residents who need skilled nursing care, long-term or short-term rehab and respite care. Both locations offer a skilled, caring nursing staff. General therapy including physical, occupational and speech are available, and so are niches such as orthopedic rehab and respiratory care. Northwoods offers a secured memory care unit, while Maple Crest maintains a post-hospital cardiac care service. The staff is both skilled and experienced, with some members serving here as long as 25 years. Their expertise has also helped to create a surprisingly low hospital re-admittance rate of just 6 percent. The 40-year-old twin buildings are meticulously kept, which enhances the quality of life for residents, and will soon see major renovations. Who doesn’t want happiness, peace of mind, security and financial stability in their later years? Wesley Willows, in Rockford, makes that promise to each of its nearly 600 residents. This sprawling community covers 234 acres, and its facilities include everything from independent living homes to apartments, assisted living and nursing care. In all, the property has some 234 homes, more than 200 apartments for independent or assisted living, and more than 90 beds dedicated to long-term nursing care, memory care and Medicare-certified rehab. The minimum age of entry is 55, and because the community serves a wide range of seniors, the Town Center is a hub of activities serving mind, body and spirit. Boasting fitness centers with senior-friendly equipment, an aquatics center, libraries, game rooms, conference rooms, dining options and a bank branch, there’s plenty to keep an active senior busy. Transportation services are available for on-campus and off-campus travel, and there are constant social activities. Best of all, most programs are organized by residents of Wesley Willows. Program staff may organize an event, but many groups and activities are generated by neighbors gathering together. The nonprofit organization is supported by a financially minded strategic plan, which includes an annual investment in facility improvements. An annual financial report is available to residents and their families. Wesley Willows is accredited by CARF-CACC, a group that recognizes responsible management at an elite number of continuing care communities around the U.S. The Kirk’s Place Alzheimer’s center is a state-certified specialty care unit. Costs ultimately depend upon the living situation. Lawn care, home maintenance and housekeeping are covered. Meals are served at several dining rooms three times a day. As part of Wesley Willows’ promise of security, residents who can no longer afford care are guaranteed a place to stay. For families exploring a move to retirement communities, Pratt says it’s never too early to start. It’s easier to reserve a spot far in advance, than to wait for an emergency placement when a crisis hits. He’s seen people prepare as much as 16 years early. 414 S. Wesley Ave., Mount Morris, Ill. The cozy community of Mount Morris, Ill., is home to Ogle County’s premier retirement community. Founded 120 years ago as a home for orphans and widows, Pinecrest Community is a safe and comfortable living environment for seniors. Residents at this continuing care facility can move through its four residential settings as their needs evolve. It also helps that Pinecrest has recently garnered national accolades. This May, the Pinecrest Manor skilled care center for the second time in three years achieved a five-star status with the Center for Medicare and Medicaid Services, placing it among the top American nursing homes. Meanwhile, the Pinecrest Pathways in-house therapy program won a Best in Class customer satisfaction ranking from Pinnacle. The award noted consistently high praise from therapy clients, who can access a chiropractor and both inpatient and outpatient care, in services such as physical, occupational and speech therapy. Rehab clients temporarily reside in a special area while attending the unique rehab clinic. Set on 40 acres at the edge of Mount Morris, Pinecrest is a vibrant community. Activities are constantly taking place inside the massive Grove community center, which doubles as a venue for community theater and weddings. Residents enjoy the cafe, library, wellness center, salon and artwork displays. 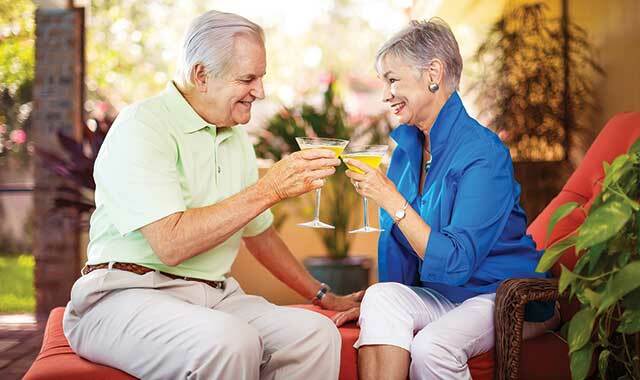 Active seniors can move into the Pinecrest Grove independent living cottages starting at age 62. Completed between 2006 and 2011, the cottages come with maintenance services and modern amenities. Pinecrest Village residents can live independently in comfortable studio, one- and two-bedroom apartments, while indulging in conveniences such as a formal dining room, activity rooms with billiards and books, and a woodworking shop. Pinecrest Manor offers skilled and intermediate care for those with greater needs. Residents have private rooms with large windows, and can access daily chapel services, dining options, and regular activities such as music and visiting pets. Pinecrest Terrrace offers state-of-the-art Alzheimer’s and dementia care inside a secure environment. This spring, Pinecrest became home to a satellite location of ABLE Home Services, a group that offers in-home care including medication reminders, safety checks, light housekeeping and bathing assistance. The campus is also home to a chiropractor’s office. “ABLE’s services will complement the efforts of our team of professionals to assist with and promote a healthy lifestyle for the residents of Pinecrest and the surrounding community,” says Ferol Labash, Pinecrest CEO. A nonprofit that is independently owned and operated, Pinecrest supports its residents even in the event of hardship. Nearly 48 percent rely on public aid; many also benefit from Pinecrest’s Good Samaritan Fund. Mount Morris is in the heart of Ogle County, and is a quick drive from larger communities. Located between Chicago and the Quad Cities, Pinecrest is about 15 minutes from Dixon and 40 from Rockford. Antiquing, fine dining and quaint shopping in historic communities are just a short drive away. Founded by the Church of the Brethren, Pinecrest Community is rooted in faith, but is open to all. Presence Saint Anne Center and Cor Mariae Center feel almost like a hospital, but that’s an important signal of what’s inside these sister communities. At both places, a consistent staff of nurse practitioners is available around-the-clock, and often coordinates with patients’ personal physicians. An in-house physiatrist sees patients several days a week, as does a certified wound care specialist. Many diagnostic services are performed in-house, such as EKG, X-Ray and ultrasounds. Because so many services are available in one place, Humana and Personal Care insurance companies have given both centers a Tier 1 status for efficient patient service. While Saint Anne Center offers long-term nursing care and short-term rehab, Cor Mariae Center covers a continuum of care, from supportive living to sheltered care. Cor Mariae Center was also chosen as one of 70 facilities nationwide to join the Interact 3 program, a new staff training program that helps to avoid re-hospitalization of patients. “We strive for high-quality care,” says Veronica Coronell, billing and marketing specialist at Cor Mariae Center. One signal of that quality, she says, comes from the Centers for Medicare and Medicaid, which consistently rates Presence among the best in the nation for staffing, quality and regulatory compliance. Inpatient rehabilitation units at both locations serve short-term, post-operative patients in a comfortable environment, where they have access to regular physical, occupational and speech therapy. Rehab may include planting a garden box or lifting groceries. Part of the emphasis on care comes from Saint Anne Center’s and Cor Mariae Center’s parent company, Presence Health, one of the largest Catholic health systems in Illinois. Built from a merger between Provena Health and Resurrection Health Care, the Catholic-owned organization operates 12 hospitals and 27 senior living facilities. Saint Anne Center includes 179 licensed beds; of them, 119 are Medicare-certified, and 60 are Medicaid-certified public aid beds. Each wing has its own community room, dining room and activities, and residents can visit chapel several times a week. Cor Mariae Center is located in a former convent on 26 wooded acres, and includes 162 beds, community areas and a memory care unit. The large complex includes a large-screen theater that hosts Friday night films, and a chapel with daily Mass and Thursday Protestant services. Each unit has its own common spaces and nurse station; the rooms are small and cozy, while the Msgr. Wahl Courtyard has a waterfall, walking path and seating area. Both facilities offer respite care, a temporary residence for seniors who need daily assistance. As families prepare for a move to retirement living, it’s important to know the services your loved one can obtain. This entry was posted on Monday, July 1st, 2013 at 11:58 am	and is filed under Home & Garden. You can follow any responses to this entry through the RSS 2.0 feed. Both comments and pings are currently closed.